I Just Bought These 3 Stocks. Should You? Okay, so one of the stocks is an index fund, but they represent the three most recent additions to my portfolio. It's one thing to research companies and make recommendations on paper as to what investors other than myself should or should not do with their money. It's an entirely different thing for me to use all that information to make my own investing decisions. So to bridge the gap between what I write and what I actually buy, I thought I would share the three most recent investments I made and why I picked them. 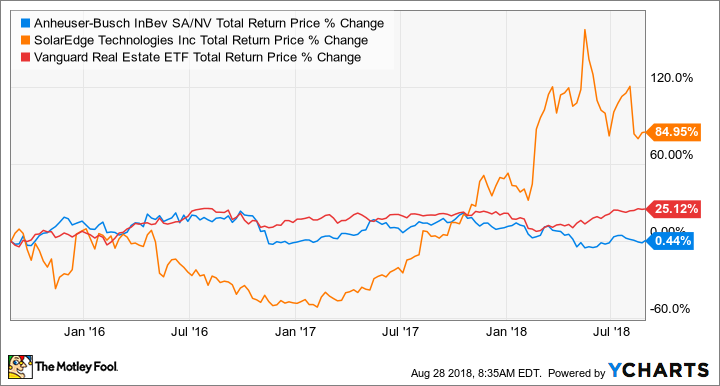 Hopefully, my thought process will help shape yours on Anheuser-Busch InBev (NYSE:BUD), SolarEdge Technologies (NASDAQ:SEDG), and the Vanguard Real Estate ETF (NYSEMKT:VNQ). It's easy to throw shade at Anheuser-Busch in the U.S. for its uninspiring portfolio of beer and weak volume growth in North America. I can't really argue that point, but what I will say is that focusing on North American sales misses the greater opportunities the company has overseas. Living overseas has given me a much greater appreciation for the market opportunity available to it in emerging economies. To get a little perspective here, let's focus on Africa, a region in which AB InBev now has a significant presence thanks to the 2016 acquisition of SAB Miller. In Nigeria, a population of 190 million and growing at 2.4%, it used its strengths in distribution and marketing to develop a new brand, Hero, in 2012 that has already become the third-largest-selling brand in the country. The Nigerian beer market is one of the 10 fastest-growing markets, growing at 9% annually, and AB InBev recently completed a $250 million brewery in the country to expand its production capacity. Nigeria isn't the only place in Africa where the company is investing heavily, either. Management also recently announced it was building a 1 million-hectoliter brewery in Tanzania for $100 million and a 2 million-hectoliter facility in Mozambique. Clearly, it sees a chance to take market share and have a significant stake in some of the fastest-growing beer markets in the world. I mention the African market specifically because I live there and I have a rough idea of what the company is up against, which is primarily regional brewers and limited customer selection. Compared to more competitive markets like Europe and North America, taking market share in Africa should be a layup. AB InBev has also identified similar opportunities in Latin America and Asia that could fuel decades of growth for the world's largest brewer. Don't let your choice of beer in North America make you overlook what AB InBev has going on overseas, because you could be missing out. The solar power industry has been growing in the U.S. at an incredible rate. The Solar Energy Industries Association estimates that it has grown 59% annually this decade. Even more incredible is that residential and commercial solar installations have grown even faster than that. Unlike utility-scale solar-power farms that take up acres of land, residential and commercial installations (think on top of a commercial building) are much more space constrained, which means that things like efficiency and getting the most out of each square foot of panel space are of great importance. SolarEdge Technologies' products -- inverters and optimizers -- are components needed to convert power from the direct current that panels produce to the alternating current used in outlets. What makes SolarEdge's offering unique is that it optimizes power output, allows for individual panel monitoring, and is more easily scalable than other systems typically used for smaller-scale installations like those for residential and commercial applications. SolarEdge's products have been so effective that they have rapidly developed a leading market share. The company went from having 1% of the U.S. residential inverter market in 2012 to 44.9% in the first quarter of 2018 and is now the world's largest supplier of single-phase power inverters for photovoltaic solar panels. This has resulted in sales growing 66% annually over that time frame, and the company is now solidly profitable, with no debt and loads of excess cash generated from operations. I have no expectations that the company will be able to grow as fast as it has in recent years. Competition in this business is fierce, and manufacturers of solar panels and equipment go through rapid cycles of over- and undersupply as companies try to keep pace with industry growth. However, management estimates that panel installations will grow from 93 gigawatts globally in 2017 to 143 gigawatts by 2022 and that residential, commercial, and smaller-scale utility installations will be a large portion of those sales. Despite a large growth runway ahead of it in the next few years, the market is pricing the stock for a rather modest performance, with a price-to-earnings ratio of 19 times, which is below the S&P 500's aggregate P/E ratio. For a company with so much growth ahead of it, this seems like a great value. BUD Total Return Price data by YCharts. I've been told that as a younger person, I have a bit more leeway when it comes to investing and should be looking to take more risk on growth stocks because, well, I have more time to make up for mistakes. That's probably true, but I don't see why I have to when I can invest in high-yield dividend stocks and let the power of reinvested dividends work their magic over multiple decades. Real estate investment trusts, or REITs if you like, are one of those special, tax-advantaged investment vehicles that can pay generous distributions and fit nicely into retirement accounts. Also, real estate tends to be a more defensive industry that doesn't grow by leaps and bounds but is less likely to experience downturns. Just because a sector is defensive and stable, though, it does not mean that a company itself in that industry is. Companies that pay large dividends or distributions have to be excellent capital allocators and prudent managers of balance sheets. Real estate is, on the whole, a more debt-intensive industry in which overpaying for assets can sap returns in a heartbeat. While I have a few REITs in my portfolio already, I'm still familiarizing myself with the companies in this space and the drivers of the specialty industries they target, such as hotel and retail REITs. In the meantime, I can get exposure to the broader REIT space through low-cost index funds such as Vanguard's Real Estate ETF, which tracks the MSCI US Investable Market Real Estate 25/50 Index and has a low expense ratio of 0.12%. Because I have actually invested in more than 186 REITs at once, the chance of a single company in this industry blowing up having a significant impact on my portfolio is rather low. Plus, it gives me an even greater incentive to become more intimately familiar with the industry. To top it off, the ETF's dividend yield over the past 12 months is 3.5%, which should go a long way when compounded over a decade or more.